We have all craned our heads skywards and marvelled at the machines that ride the skies above our heads; many of us have been fortunate to be carried to destinations near and far in all manner of these remarkable machines, machines that we often take for granted. But what makes up an aircraft? What are the differences that separate the graceful soaring of a glider from the roar of a fighter climbing into the blue? 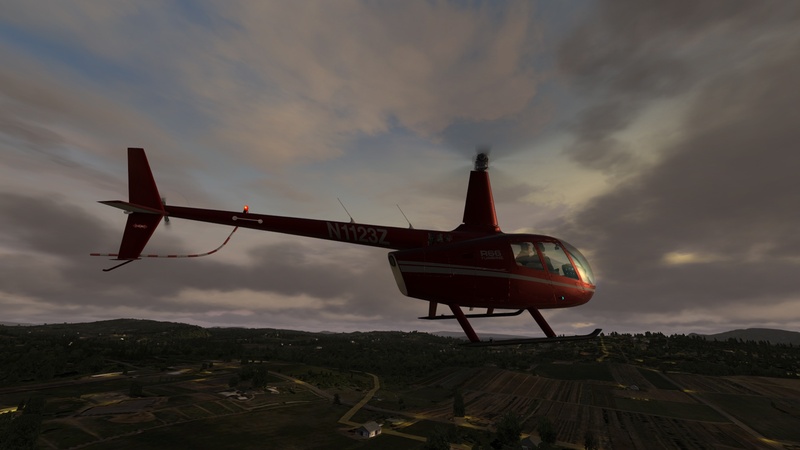 In this article we have a lot of ground to cover and some of it might seem intimidating, but one of the great things about flight simulation is that we can put this theory into practice. 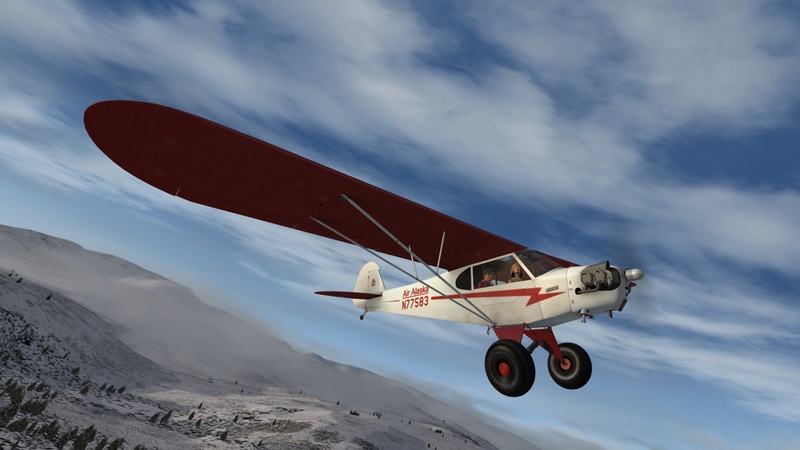 As the title of the article suggests we are going to be working through the basics of Aviation 101, from what an aircraft is, through the basic principles of flight and onwards to types of flight. Buckle in, we’re going flying! Let us start though with something innocuous, what is an aircraft? An aircraft is any machine capable of flying by means of buoyancy or aerodynamic forces. So, what does that mean? Well the machine part is fairly obvious, but the latter part is what we should look at first before we look into what makes up aircraft more closely. 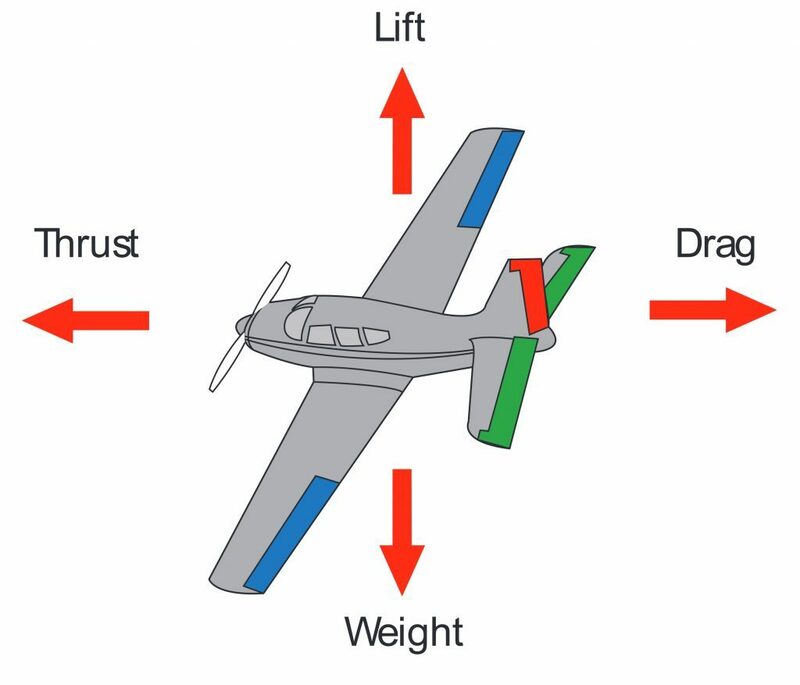 All aircraft, no matter their size or shape, are affected by the same four forces: Thrust, Drag, Lift and Weight. These forces are acting on an aircraft anytime it is airborne, even if they may not be obvious. There are two distinct types of aircraft and they are divided based on how they employ these forces, and more importantly how they derive their Lift – or the thing that keeps them up in the air! An Aerodyne generates its lift by the movement of air over a wing or wings whilst an Aerostat derives its lift from a gas. So now we have the four forces with us, let us dig a bit deeper into these two classes of aircraft. We are going to start at the beginning (literally) as the first manned flight was aboard a lighter-than-air aircraft, in other words an Aerostat. Aerostats all share the fact that their lift is generated through the use of gas; which may be heated air or a gas which has a lighter density than air such as helium or hydrogen. This gas is contained inside an envelope to which can be attached the crew compartments and sometimes additional structures such as engines, cargo storage or even miniature wings. But how does this work? The science behind it relates to fluid dynamics (as air is really just a very thin liquid) and Archimedes Principle. A balloon will continue rising into the sky until the pressures are balanced at a point where the lift can support the weight but will not rise further. A balloon controls these pressures by releasing gas in order to descend and dumping weight to rise up again. Balloons rely solely on winds as their means of thrust and lack any form of directional control. Airships differ from their more uncontrolled counterparts in that they feature an engine to provide thrust and would have small control surfaces (think miniature wings) to provide directional controls. The ability to master directional controls coupled with the lifting properties of lighter-than-air aircraft and relatively low costs to operate, Airships would find major prominence throughout the first half of the 20th century, being a common sight across the skies of Europe and the Americas. Today both forms of Aerostats can be found alive and well, their low operating costs seeing them come back into favour. Whether it be a champagne breakfast watching the sunrise beneath a hot-air balloon or the platform filming the Superbowl; Aerostats, once thought on the verge of abandonment, are here to stay. Aerostats are a fairly rare thing in the virtual aviation world however, mainly due to their flight-models not being catered for in great detail. Nevertheless you can use these thanks to some very innovative developers out there (my favourite is the Zeppelin NT). Horizontal wings are the primary source of lift on an aerodyne. They are usually bulged on one side and towards the front leading to a difference in pressure resulting in the upward force of lift – also known as Bernoulli’s Principle. By adjusting this flow of air over these surfaces a pilot can control an aerodyne. When a pilot moves the controls of an aerodyne, it is to control the three Axes of Flight – Pitch, Roll and Yaw. Pitch adjusts the up and down direction of the nose of the craft and are controlled by elevators. These are usually located as part of the horizontal stabilizer (the little wing at the back of the aeroplane). Roll adjusts the rotation of an aircraft and is controlled by ailerons. 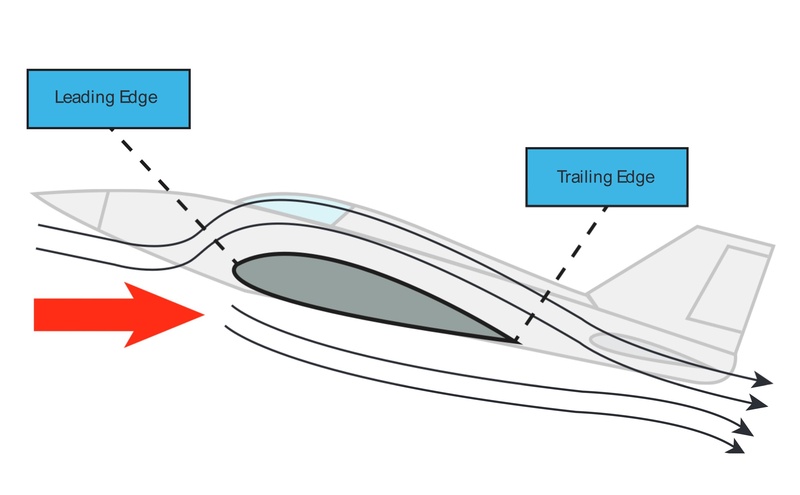 Ailerons are located on each wing and act to push one wing up while pushing the other down. 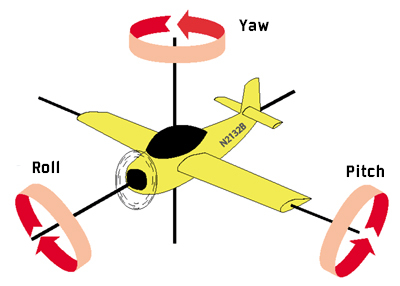 Yaw is the side to side motion of the aircraft and is controlled by manipulation of the rudder. Moving the rudder changes the airflow past the tail of an aircraft and pushes the tail in one direction or another. By balancing these three axes and the thrust keeping the air flowing over the wings, an aerodyne is able to maintain controlled flight. Powered fixed-wing aerodynes – aeroplanes – generate thrust through an engine; whether that engine be a propeller, an air-breathing jet engine or a closed cycle rocket engine. Un-powered or free flying fixed-wing aerodynes – gliders – initially will rely on a launch mechanism to get them into the air to generate their initial lift; such as a tow aircraft or being launched off a hill. Fixed-wing aerodynes have been designed to operate in a wide variety of roles and operating environments encompassing recreational and training activities, through agricultural and cargo transportation to passenger carrying. Rotary-wing aerodynes share many attributes with their Fixed-wing compatriots, such as fuselage, horizontal and vertical stabilisers and landing gear. The primary difference between them is in the way the wings operate. Instead of using fixed horizontal wings, Rotary-winged aerodynes use a series of wings (rotor blades) spinning around a mast to produce their lift. The same aerodynamic principles still apply, except that the turning of the rotor blades induces the lifting force as opposed to relying on forward motion of the whole aircraft. To achieve stable flight the spinning of the rotor blades needs to be balanced either by a tail rotor – a smaller set of blades mounted perpendicular to the plane of the main rotor – or through the use of multiple sets of rotors blades (like a Boeing-Vetol CH-47 Chinook). The significant advantage of a Rotary-winged design is that it can maintain its position horizontally as well as vertically, resulting in the ability to land and take off without the necessity of runways and prepared landing areas as a Fixed-wing aerodyne does. The challenge that it raises is that the thrust to weight ratio must be very high in order to drive the rotor blades fast enough to generate the required lift to get airborne. Rotary-winged craft provide capabilities of operating in confined areas and terrain that is otherwise inaccessible to aircraft. This along with their ability to maintain their relative position through hovering have led them to prominence with emergency services, tourism and remote location supply roles around the world. Having now defined what an aircraft is, the next step is to discuss the categories they are grouped by. All aircraft operate within atmosphere, however their operation is classified into a series of regimes based around their normal operational speed relative to sea level. This regime is in common use by helicopters and smaller aircraft. These aircraft fulfil a variety of roles including agriculture, emergency service support, small scale passenger transport and water operations. Examples of aircraft in this regime include the Grumman Albatross and the Piper Aztec. This regime is populated mostly by commercial and military jet aircraft where the aircraft operate up to just below the speed of sound. Some aircraft in this category are also considered to be transonic in that they have the ability to operate in excess of the speed of sound but do not do so routinely. These aircraft are characteristically used for commercial carriage of freight and passengers as well as military combat and support applications. Examples of aircraft in this category include the Boeing 737 and the Lockheed Martin F-16. Aircraft that populate this regime are designed to operate primarily at speeds faster than the speed of sound. Presently this realm is exclusive to military aircraft, high speed fighters, bombers and reconnaissance aircraft. There has only ever been one commercially operated aircraft in the class, the Concorde. Aircraft in this category are characterized by very clean aerodynamic designs and often highly swept wing in a delta style. The Convair F-106 Delta Dart and the English Electric Lighting are examples of this type of aircraft. Hypersonic aircraft design is the highest tier of aircraft operation. Due to the rise in atmospheric friction as airspeed increases as well as the change of the attributes of air at such high speeds Hypersonic flight offers daunting challenges to engineers. This speed range is most commonly experienced by spacecraft upon re-entry to Earth’s atmosphere or rockets leaving it. Thus far there has only ever been a single manned aircraft that has achieved Hypersonic flight – the North American X-15. The X-15 was a rocket powered aircraft that was carried aloft by a B-52 mother-ship before being launched to the edge of the atmosphere and beyond it. Since the end of the program in 1968 the only other aircraft to achieve hypersonic flight have been unmanned research aircraft. In this article, we have introduced the definitions of an aircraft, discussed the main types of aircraft and what they constitute of. Beyond this we have also examined the classifications of flight regimes as well as a brief introduction to some of the methods of achieving and maintaining controlled flight – all told a lot of ground has been covered. Aviation is a science that is always evolving, and an exciting field to be part of; both in the real world and the virtual world.